It’s an idea that should have arrived sooner. The idea of a universal playlist free from regional restrictions of music streaming surely has struck most of us at one time or another. It was far easier for a short while during the age of Napster. Enter online music streaming services The 14+ Hottest Music Streaming & Discovery Sites The 14+ Hottest Music Streaming & Discovery Sites Read More like Spotify, Pandora, Last.fm, and Rdio just to mention a few…and your musical choices aren’t restricted to what’s on your hard drive or that of your friends anymore. The only restriction is placed by geography. Barring the United States, most of the services are kept restricted to a large portion of the globe due to various reasons. That limits what Joe in the U.S. can share with his friend Joy in India. And here we thought that music was a universal language! Bop.fm [No Longer Available] is a new music streaming application that wants to transcend these restrictions and create a common home for all your songs. You don’t have to jump ship from your favorite music service either. Bop.fm wants everyone to play nice, and thus it creates a universal playlist by aggregating your songs from the music services you currently are listening to. You can share songs easily with anyone on any streaming site, and also keep yourself in the loop with what they are recommending. The problem — the fragmentation of listening to music. Sharing music was supposed to be simple, but it isn’t! Music is a social experience. Now more than ever. Your friends may be on different music websites, and that itself creates a hassle of sharing great songs. You can’t be bothered about signing up to a new service every time someone shares a link with you and you find that the song isn’t available on your own favorite site. Then, on each music service everyone probably has a different circle of friends. There are many online music services without restrictions 6 Online Music Streaming Services With NO Restrictions 6 Online Music Streaming Services With NO Restrictions Finding a completely unlimited music listening experience can be a challenge. So, if you want complete control over your listening experience, check out these six completely free options... Read More . They are good but they still aren’t popular as Spotify, Rdio, and the other worthies. Music sites like Blip.fm, Grooveshark, and 8Tracks (read our 8Tracks review Enjoy Curated Music Mixes And Discover Great Artists On 8tracks Enjoy Curated Music Mixes And Discover Great Artists On 8tracks Unlimited streaming music, for free, legally available all over the world, and with no audio ads. Have I got your attention yet? Dive into one of the best music websites in existence. Read More ) help you create extensive playlists and also dip into the ones created by others. But whichever you choose, you choose a “closed” garden. YouTube is one comparative exception. The Bop.fm solution — aggregating all your favorite music services and sources in one music service. The goal is for anyone to play any song, using any service, and share with any friend, even if your friends are on a different music service. The intelligent music curation doesn’t break any licensing restrictions as Bop.fm does not host any of the songs itself. The service sources songs from YouTube, Deezer, SoundCloud, Rdio, and Spotify for now. Bop.fm keeps it simple: Sign-in with your Facebook account and you are good to go. You can sign into the music streaming service of your choice from within Bop.fm and search for the songs. 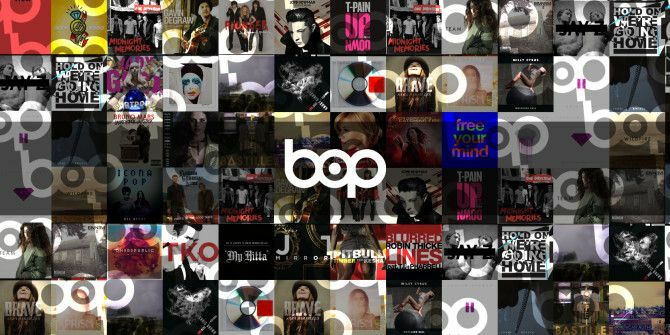 Bop.fm uses intelligent curation to catalog songs from the streaming sites it presently connects to. If the songs searched for are available on the service you use, Bop.fm will display them first. Music discovery 6 Fantastic Ways To Discover Cool Music You've Never Heard Before 6 Fantastic Ways To Discover Cool Music You've Never Heard Before If you’re a music lover, you’re familiar with the constant need to discover new music. You already know lots of good music you like, but the thirst for more is unstoppable. There’s lots of good... Read More is also given space if you like listening to anything – you can click on Surprise me on the homepage and start listening to random tracks. No more “Currently not available in your country”: If there are region restrictions handicapping you, then Bop.fm sources the songs from YouTube and SoundCloud, and plays them from there. Usually, I found it picked YouTube first, but you can select SoundCloud with a click. Create your own shareable playlists: You can create your own universal playlists on Bop.fm and share it with friends across the globe. You can include songs from any of the connected services for your universal playlist. With open options like SoundCloud and YouTube available to them, you don’t have to worry if your friends will get to hear the songs if they aren’t on any of the other services. Use the MetaPlayer: Bop.fm uses the MetaPlayer framework for an embeddable player you can use to share your songs on blogs, websites, and forums. MetaPlayer works in all countries and across all platforms — web, mobile, or tablet. Purchases songs: Bop.fm also catalogs songs from iTunes, Amazon, and Google Play. A click takes you to the sites if you are interested in a purchase and download. Did Bop.fm Strike A Good Note? Bop.fm is in beta. But it strikes the right note. The Y Combinator startup is filling a key niche that has existed for some time with the weed-like growth of music services. Bop.fm reminds me of Tomahawk Player which is a downloadable cross-platform player for Windows and Mac. Bop.fm is a far easier implementation for music curation, and with the gradual (hopefully) addition of other services, it can only grow popular from here. Try Bop.fm [No Longer Available] and come back singing (or criticizing) to tell us all about it.